All you have to do is simply upload a short 360 video clip and their software converts it into a panomoment. To create a panomoment from a 360 video, you’ll need to use a video that was shot on a tripod. 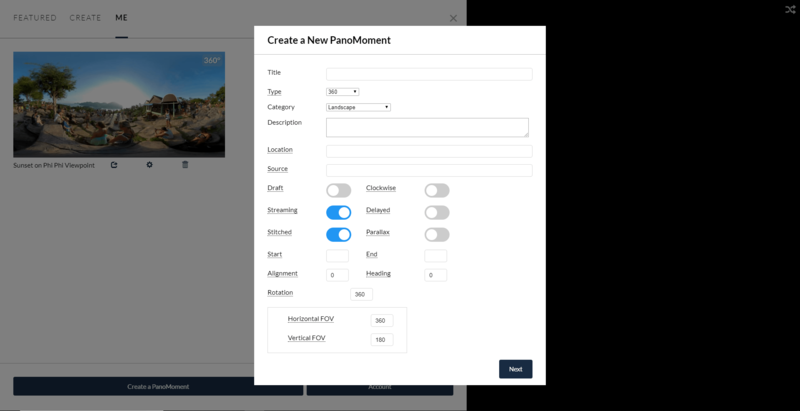 Panomoment will take frames from your video. The first time I tried I used a 2 minute time lapse. After uploading the file to Panomoments.com, their software will create a panomoment. It takes a few minutes of processing and you will get an email when it’s ready to view. Im impressed with this and I think it has great potential. It’s was pretty easy to use to, but as you can see the software used the frames from only the beginning of my video on my first attempt below. After chatting with Dustin Kerstein the founder of panomements he tells me the format is currently limited to 300 frames. On the first page of the uploader you can specify start/end times to trim, or you can trim before uploading. At 30fps you get 10 seconds, and at 60fps it’s 5 seconds. You need to upload a short video or use an editor to speed up your video so it’s no longer than 10 seconds at 30fps, so that’s what I did and as you can see from the first video at the top of the page it worked more like the way I had expected it to. Initially when it finished processing the heading on load was in the wrong direction and the sunset started and finished in the wrong place (looking in the wrong direction). I had a little more learning and playing around with the settings to get things right. I had to change the alignment and heading, so the sunset effect started and finished where I wanted it to looking toward the sun. You can do this by opening the panomoment and using the [ ] bracket keys on your keyboard, you then see the info pop up on your screen showing your current heading and alignment coordinates. Move to your desired direction make a note of the coordinates and copy them into your panomoment settings. It’s as simple as that. Have you created a Panomoment? Do you like the effect?